This recipe was clipped from a magazine and found in a large collection, date unknown. I’ve typed it below along with a scanned copy. Wash cucumbers and slice thin. Combine cucumbers, onion, green pepper, garlic, and salt in a large Dutch oven. Cover with crushed ice; mix thoroughly and let stand 3 hours. Drain. 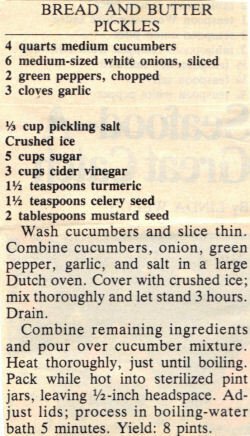 Combine remaining ingredients and pour over cucumber mixture. Heat thoroughly, just until boiling. Pack while hot into sterilized pint jars, leaving 1/2-inch headspace. Adjust lids; process in boiling-water bath 5 minutes. Yield: 8 pints.